Patti Cooper is the Fitness Coordinator at Patriots Landing. Patti holds a degree in Physical Education and has taught at the secondary school level, but eventually found her way to working with adults on the other end of the spectrum! Patti first heard about SAIL in 2009, and immediately signed up to take the 10-week online SAIL Program Leader training through Pierce College. Patti leads SAIL fitness classes every weekday at Patriots Landing. These classes are open to all members of the Patriots Landing community. Patti proudly tells us that among the older adults who attend her SAIL fitness class regularly and are classified as living independently, there have been NO injury transports to a medical facility due to a fall. Donnie Weeks was living in her home of 45 years in 2003 when she was invited to take part in a research study focused on fall prevention. She signed up and became one of the original 453 older adults that were the genesis of the SAIL Program. Donnie remembers going to the Lakewood YMCA three times weekly for a year to participate in the SAIL fitness class. “I learned so many things”, Donnie tells us. “I learned not to run to try to answer the telephone, and not to run to answer the door.” Although SAIL is primarily a fitness class that incorporates aerobics, strength, balance, and stretching exercises, an educational topic is included in each session. The original research study for SAIL found that older adults value information given to them by a professional that can reduce their risk for falling, and Donnie’s comments illustrate how much she valued the educational component. Donnie moved to Patriots Landing in 2005 after her husband passed away. She was delighted to find SAIL again at Patriots Landing, and is a faithful participant in the fitness class. Donnie encourages administrators of retirement communities to consider incorporating an evidence-based program such as SAIL at their site due to the many benefits that it provides to the residents. Jim McDermott also lives at Patriots Landing and is a champion of the SAIL Program. “I have lived here since Patriots Landing opened in 2005; I am one of the charter members”, Jim says. “I have been taking group exercise classes continually as well as walking up to a mile and a half a day. I like SAIL because it is comprehensive. It works all areas of the body. We start off with warm-up, and do strength exercises and balance. I would be at higher risk of falling if I was not taking SAIL, particularly the balance drills”. At 95-years-young, Jim’s age is no longer listed on the table of normative values for the Fitness Checks that are part of a SAIL Program (normative values have been calculated for adults ages 60 to 94 years). 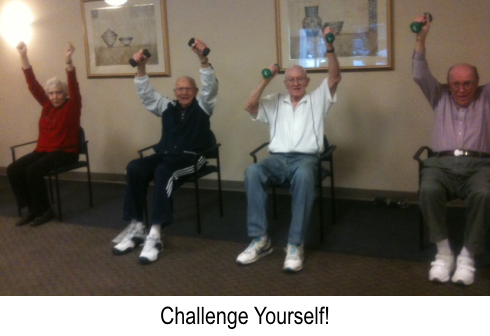 Jim scores above average in the 90-94 years age category for the three Fitness Checks that are part of a SAIL Program (8-Foot Up-and-Go Test, Biceps Curl, and Chair Stand). He attributes his above average performance to his regular attendance at the SAIL fitness class. Patti has approximately 35 persons enrolled in her SAIL Program, and on any given day about 20 persons attend the SAIL fitness class. Of these 35 persons, only two are under 80 years of age. The majority are over 85 years old, and several are over 90 years old. Is it safe for persons of this age to begin an exercise program? Absolutely! Older adults should first receive a physician’s approval to begin an exercise program, and then look for a program that is specifically tailored to the needs of the older adult. SAIL is a perfect choice. “SAIL does a great job of allowing a beginner to come in without becoming overly exerted”, says Patti. “You’ll learn the routine right away, because I will do it with you. The class allows you to challenge yourself without going into any pain.” Patriots Landing is a retirement community located on 16 acres in the pristine Pacific Northwest, and includes independent cottages, independent apartments, assisted living apartments, and a memory care unit. Patriots Landing was established through the visionary leadership of Gene Lynn who served in the U.S. Army. The property was established to give back to those who have given so much to protect our freedom. We extend our congratulations to Patti Cooper and everyone at Patriots Landing who has demonstrated the extraordinary benefits of placing an evidence-based program in a community of older adults. Patti, thank you for your commitment to reducing falls in older adults!